Huge numbers of new homes were built in the Victorian era. Census returns for 1801 and 1851 show the population almost doubling during those years; between 1801 and 1911 it almost quadrupled, rising from about 9 million people to 36 million by 1911. In total, the number of houses built rose from about 1.6 million in 1801 to about 7.6 million by 1911. Do you live in one of the millions of Victorian houses in the UK? Are you planning a house and garden make-over? Do you want to restore the golden age of Victoriana within your home and garden? This blog examines home improvements that the ordinary "Do It Yourself" amateur can make to his or her garden. 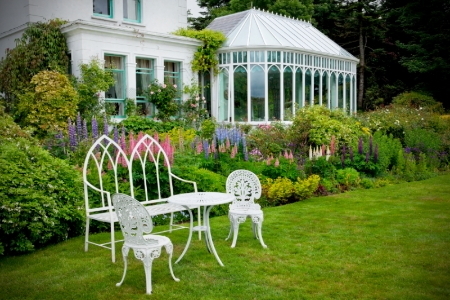 The first step in garden design, particularly of a front garden, is to decide upon a focal point. What could this be? An obelisk, a sculpture, a statue or a pond? No, there is no better choice than the iconic Victorian post box. In the British Isles the first pillar post boxes were erected in Jersey in 1852. Roadside wall boxes first appeared in 1857 as a cheaper alternative to pillar boxes, especially in rural districts. In 1853, the first pillar box in Britain was installed at Botchergate, Carlisle. In 1856 Richard Redgrave of the Department of Science and Art designed an ornate pillar box for use in London and other large cities. In 1859 the design was improved, and this became the first National Standard pillar box. Green was adopted as the standard colour for the early Victorian post boxes. Between 1866 and 1879 the hexagonal Penfold post box became the standard design for pillar boxes and it was during this period that red was first adopted as the standard colour. The first boxes to be painted red were in London in July 1874. Where can I purchase one of these vintage post boxes, constructed from durable cast aluminium? Look no further than Brilliant Wall Art. They provide an extensive range of contemporary and quality decorative metal wall art, home and garden accessories at the lowest possible prices. Brilliant Wall Art promise to be the most competitive online service and therefore the cheapest. The grey post box measures approximately 103cm (40.5") high x 32cm (12.5") wide x 32cm (12.5") deep. Black Magic…now you see it, now you don’t, with this removable shelf if you wish to divide the post box between letters and parcels. Want it white? The letter slot will take post and letters up to A4 size. Green for go…this pillar post box features lockable doors, front and rear to keep your mail safe. Examine this bronze post box with a square base with an interior grid which could be bolted through, if required, with a freestanding design. Even if your home is not in the typical Victorian style, you can still incorporate Victorian elements such as focal points, painted wrap-around porches, exotic shrubs, ferns, symmetrical flowerbeds, cast iron fencing and ornate woodworking. Whatever your budget, there are plenty of ways to re-style your garden, whether you live in a simple terrace, cottage, house, bungalow, or even a two-storey clapboard farmhouse. Victorians loved their flowers. Even if your home is not in the typical Victorian style, you can still incorporate Victorian elements such as painted wrap-around porches, symmetrical flowerbeds, and ornate woodworking. 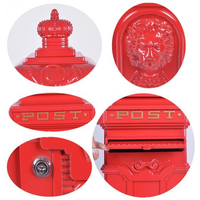 The starting point for your exciting project is the purchase of a Vintage Grand Pillar Post Box from Brilliant Wall Art. If you have any questions about our wall art, home or garden accessories, please do not hesitate to contact us today.